If you're on the hunt for a casual yet absolutely chic look, try teaming a black linen trenchcoat with a honey punch gold party skirt from shoptiques.com. Both pieces are totally comfy and will look fabulous together. Bump up the cool of your getup by complementing it with black leather ankle boots. If you're on the hunt for a casual yet totaly chic getup, team a black chiffon button down blouse with a gold skater skirt. Both of these pieces are super comfortable and will look great when worn together. Opt for a white cable sweater and a gold skater skirt, if you feel like functionality dressing without looking like a slob. Let's make a bit more effort now and grab a pair of beige leather pumps. 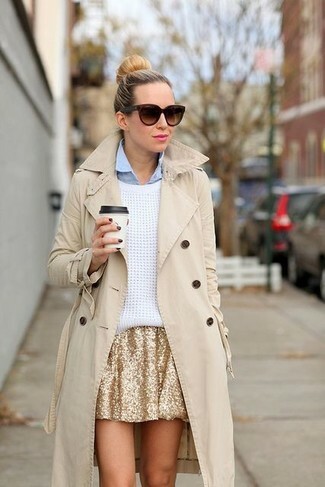 If you're looking for a casual yet stylish outfit, make a beige trenchcoat and a Honey Punch Gold Party Skirt your outfit choice. Both items are very comfy and will look great when paired together. If you don't like spending too much time on your combos, marry a black long sleeve blouse with a honey punch gold party skirt. Rocking a pair of black nubuck ankle boots is a simple way to add extra flair to your look. We all look for comfort when it comes to dressing up, and this combination of a charcoal crew-neck t-shirt and a gold skater skirt is a practical illustration of that. You could perhaps get a little creative when it comes to footwear and spruce up your ensemble with silver leather pumps.